Curated by norn, in collaboration with Mark McGowan. SCAPEGOAT SOCIETY was a multi disciplinary exhibition which explored the role of the scapegoat in contemporary society. Introducing the work of several international artists to the UK, Scapegoat Society is of pressing relevance given the frightening recent success of the British National Party. Scapegoating is a hostile process through which people attempt to absolve themselves from culpability, by moving blame towards a target person or group. This age old phenomenon is as prevalent today as it was in the times of witchhunts, and is a fundamental part of the human condition. With McCarthyism and the Holocaust being phenomenon is as prevalent today as it was in the times of witchhunts, and is a fundamental part of the human condition. The socio psychological dynamics inherent to scapegoating were explored in Dr. Stanley Milgram’s notorious Obedience to Authority experiment conducted in the early 1960s, in which volunteers were asked to give seemingly real and potentially fatal electric shocks to another individual. In 2002 Rod Dickinson painstakingly restaged the experiment using the original transcripts but while Milgram intended to demonstrate the extent to which people would follow orders, Dickinson’s re enactment highlights a microcosm of human drama. The exhibition also explored the way in which society’s fears are exaggerated and propagated through the media. Rainer Ganahl plays upon collective paranoia, drawing attention to how stereotypes are deployed by both the mass media and the State. In Homeland Security IV, (2003) the artist repeats five simple sentences such as ‘I am not a terrorist’ in eleven different languages. With his unkempt appearance and deadpan delivery, Ganahl straddles the role of both hostage and terrorist humorously reminding us that there are two sides to every story. The scapegoat is commonly associated with ideas of blame, prejudice and visible difference. Its victims tend to be marginalised – pushed to the periphery of society – through the scapegoating process. 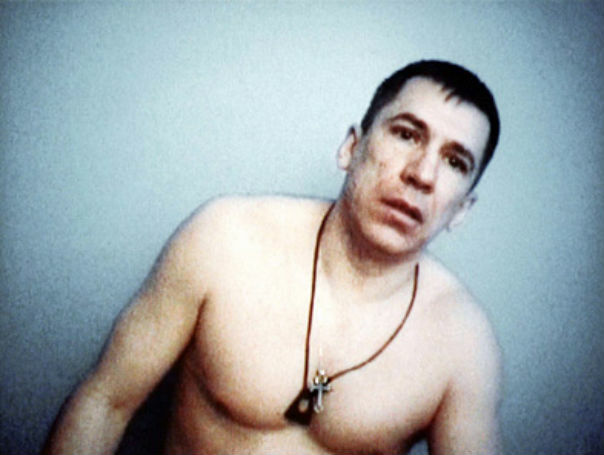 Mark Raidpere’s video Ten Men (2003) consists of static shots of inmates from an Estonian prison posing for the camera. With muscles, tattoos, broken noses and shaven heads, the prisoners display themselves as objects of fear but they also evoke pity; forcing the viewer to question whether they are brutal criminals or simply victims of society. In Two Monuments (2009), Artur Zmijewski invited Polish and Irish unemployed men and women in Dublin to work together to build monuments. His film subtly explores the nature of their relationship, highlighting the tendency to place blame on others rather than recognise the malign forces of global capitalism on local labour markets. Other artists in the exhibition rework the role of the scapegoat – transforming ‘victimisation’ into a positive representation. The work of Silke Wagner often takes an ameliorative approach to address issues of social exclusion. Wagner’s neon work 18.08.70 (2008) pays homage to the iconic political activist of the Civil Rights movement, Angela Davis, who was placed on the FBI’s Ten Most Wanted Criminals list on this date. Carolina Caycedo’s banner Immigrants Influence Home Cultures (2004) and subsequent marches refuse the role of victim by asserting a positive group identity. The Orange Alternative also inverts expected relationships as a means of protest. Founded in Warsaw in 1983, this underground movement protested peacefully against the communist regime by organising happenings such as ‘Freedom for Santa Claus’ and ‘The Revolution of the Dwarves’. The Orange Alternative’s rich archive, presented in the exhibition, documents their creative resistance to violent repression. However, to mark oneself as different is to make oneself an obvious choice for a scapegoat, as role artists often choose to inhabit and explore. The Dissident (2005) by Jacek Niegoda documents the repercussions of acting against the established norm, warning us of the dangers inherent in not conforming. In Shooting (2002) Boris Sincek re performs Chris Burden’s Shoot, replacing the context of Vietnam with his own past as an officer in the Croatian military during the ‘social oedipal drama’ of its civil war. In this cleansing act of atonement, all that stands between him and the gun clamped to the table is a second-hand bullet-proof vest.